Neuromyelitis optica (NMO) is an important autoimmune demyelinating disease that preferentially targets the optic nerves and spinal cord. Although the first clinical report of NMO occurred almost 100 years ago, a clear differential diagnosis between NMO and multiple sclerosis (MS) was only made via NMO autoantibodies in 2004, by Lennon et al.. NMO-IgG is an antibody highly specific to NMO and distributed in or near the area of the blood–brain barrier (BBB) in the central nervous system. The NMO-IgG antibody is also called the aquaporin-4 (AQP4) antibody. The target structure of AQP4 is a cell membrane water channel protein that is expressed predominantly at astrocytic end-feet that form the BBB. NMO-IgG serves as a biomarker for diagnosis and prognosis in NMO. 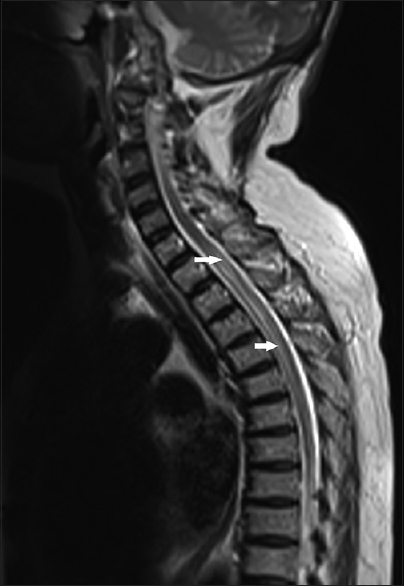 A definitive diagnosis of NMO requires the presence of optic neuritis (ON) and transverse myelitis (TM) and at least two of the following three supportive criteria for increasing the specificity of the diagnosis: magnetic resonance imaging (MRI) evidence of a contiguous spinal cord lesion in at least three segments [Figure 1]; brain MRI not diagnostic of MS; and seropositivity for AQP4-IgG. Approximately one-half of NMO patients present with isolated ON, of which about 20% is bilateral. NMO-ON generally causes severe visual field defects and has a potential to involve the longer posterior part of the optic nerve [Figure 2]a and [Figure 2]b. Seropositive patients with isolated ON or TM are currently classified as having NMO spectrum disorder (NMOSD), which has a high risk of conversion into definite NMO. Studies have shown that loss of vision is positively correlated with severe retinal nerve fiber (RNF) atrophy in optical coherence tomography (OCT) examinations. OCT further shows that microcystic macular edema in the inner nuclear layer can serve as a biomarker for NMO in the retina,. The current suggested management for acute exacerbation includes intravenous methylprednisolone (IVMP) pulse therapy and/or plasmapheresis. First-line immunotherapies for the prevention of recurrent NMO include azathioprine (AZA), mycophenolate mofetil (MMF), and rituximab (RTX),. Intravenous immunoglobulin therapy is another possible treatment. To date, no acute therapy has demonstrated significant benefits in improving visual outcomes in patients with NMO or in preventing optic nerve atrophy. Several new potential therapeutic approaches have sprung from recent insights into the pathogenesis of NMO, including complement and neutrophil elastase inhibition, and the blockers of AQP4-IgG binding to AQP4 ,,,. When a diagnosis of NMO is confirmed or suspected, any acute exacerbation should ideally be treated promptly with a high dose of IVMP for 3–5 days. The overall thinning of the RNF layer (RNFL) means a greater loss of optic nerve axons in the eyes of patients with NMO, compared to the eyes in patients with MS. Therefore, early pulse therapy with corticosteroids is critical in NMO to minimize axonal loss in the acute stage. One large multicenter, retrospective study of differences in treatment responses in patients with MS and NMO reported that IVMP is effective in NMO as a first-line treatment, but is more effective overall in MS than in NMO patients. Further prospective and randomized clinical trials to test the effects of methylprednisolone in NMO are needed. When the patient's condition does not sufficiently improve or even worsens with corticosteroid treatment, therapeutic plasma exchange (TPE, 5–7 cycles) has been suggested. TPE has been used either concomitantly or immediately following a course of glucocorticoids in progressive or refractory conditions. This is supported by the beneficial effects shown in one randomized, controlled, double-blind clinical trial of 22 patients (including two with NMO) with severe demyelinating disease. Studies have also shown that add-on TPE with glucocorticoids is superior to glucocorticoids alone with respect to final visual outcomes and preservation of peripapillary RNFL in NMO,. A short delay in initiating TPE is the strongest predictor of outcome in severe attacks of NMOSD. In severe attacks, TPE can also be considered as a first-line treatment. In one retrospective case-series study, maintenance TPE was able to sustain stabilization of the clinical course in steroid-refractory relapsing NMO. As NMO takes a relapsing course in most cases, with incomplete recovery and rapid accumulation of neurological deficits, immunosuppressive treatment should be initiated after initial treatment. Several immunosuppressive agents have been accepted in long-term disease-modifying treatment for patients with NMO. Although the results of one retrospective study suggest a beneficial effect of low-dose corticosteroid monotherapy in reducing relapses in NMO, combination regimens have been used more consistently (oral glucocorticoids along with AZA or cyclosporine). Recommendations regarding the optimal duration for preventive treatment have not been established, although continuing therapy for 5 years after the last clinical relapse has been suggested. Any decision regarding the duration of treatment should be individualized and made based on the patient's clinical course and complications. In general, physicians must take note of the risks of side effects of drugs, such as malignancy, myelotoxicity, and infection, before initiating immunosuppressive therapies. Tests for pregnancy and chronic infections (hepatitis B and C) before treatment are also important. AZA, a DNA intercalation on inhibition of de novo purine synthesis, was the first agent to show efficacy in preventing NMO relapses. A retrospective study showed that it is effective in reducing relapse rates and improving visual scores in NMOSD. The regimen is 2–3 mg/kg orally daily, along with prednisone. If prescribed, monitoring the mean corpuscular volume of the red blood cells is needed to prevent myelodysplasia. In a retrospective series, 3 of 99 patients with NMO treated with AZA developed lymphoma. RTX (anti-CD20), a depletion of B-cells and plasmablasts (chimeric monoclonal antibody [mAb]), has previously been explored in a small open-label study of NMO. Effects of RTX superior to other immunosuppressive agents have been reported,. The regimen is typically 1 g intravenously on day 1 and day 14, repeated every 6 months, with optional monitoring of CD19 cell counts (goal <0.1% total lymphocytes). One systematic review and meta-analysis showed that RTX therapy reduces the frequency of disease relapse, but the safety profile suggests caution; complications have included infusion-related adverse effects, persistent leukopenia, and posterior reversible encephalopathy. The mechanism of MMF is inhibition of inosine monophosphate dehydrogenase (de novo guanosine synthesis). Treatment with MMF is supported by retrospective studies showing reduction in the absolute relapse rate,. Regimens are typically 1000 mg orally twice daily. Monitoring the absolute lymphocyte count (goal: <1500/mL) is needed. Side effects occur in about one-third of patients, similar to the use of AZA, with the most common adverse reaction being gastrointestinal irritation. In addition to blood counts, renal and liver function should be periodically tested in patients treated with MMF. Several ongoing clinical trials may provide more robust efficacy data for new drugs. These include eculizumab (complement C5, humanized mAb), tocilizumab (interleukin-6 [IL-6] humanized mAb), and C1-esterase inhibitor. This humanized mAb that antagonizes the IL-6 receptor has also shown promising results in case reports and small case series. Tocilizumab reduced the annualized relapse rate (ARR) in 10 patients with NMO who had been refractory to RTX; six of these patients remained relapse free for longer than 1 year,. An ongoing clinical trial (TANGO) is observing the time to first relapse from initiation of tocilizumab or AZA treatment. Complement activation after binding of an IgG autoantibody to AQP4 is thought to be a major determinant of CNS inflammation and astrocytic injury in NMO. Eculizumab (Alexion Pharmaceuticals), a humanized mAb that neutralizes the complement component C5, has been approved as an orphan drug for paroxysmal nocturnal hemoglobinuria and atypical hemolytic uremic syndrome. Eculizumab was also able to reduce the ARR in 14 female patients with NMOSD, using a regimen of 600 mg intravenously weekly for 4 weeks, 900 mg in the 5th week, and then 900 mg every 2 weeks for 48 weeks. Twelve of the 14 patients were relapse free, and their disability had stabilized or improved at the end of the trial. Infectious complications, particularly meningococcal meningitis (with meningococcal vaccine obligatory prior to the start of therapy), are a critical concern with complement-inhibiting therapies. The efficacy of eculizumab for AQP-IgG-positive NMOSD is currently being investigated in the randomized, controlled PREVENT trial. C1-esterase inhibitor (C1INH) is a new drug developed for angioedema due to C1-inhibitor deficiency. C1INH works through its ability to block the actions of enzymes belonging to the over-activated bradykinin-forming pathway. The formation of perivascular complement product deposition in NMO pathology proves that the complement in acute NMO relapse is an important effector of immunopathology. The purpose of added treatment with C1INH in the acute stage of NMO is to try to palliate complement-mediated tissue injuries in both the spinal cord and the optic nerve. C1INH was given daily for 3 days as an add-on therapy to IVMP in an open-label study of ten patients with NMOSD. This study provides Class IV evidence that C1INH is safe and improves disability in patients with NMO with acute TM or ON. However, a placebo-controlled trial is necessary to confirm these findings. The new mechanistic link between human tolerogenic dendritic cells (DCs), immunosuppressive regulatory B-cells, and T regulatory cells in treating autoimmunity has recently been studied [45-47]. DCs are key regulators of peripheral tolerance, and they activate and maintain immunosuppressive states, including low antigen-presentation capacity and low-to-absent costimulation ability,. This inverse vaccination may allow for specific reduction of a pathological autoimmune response while leaving the remainder of the immune system intact. Key questions remain to be clarified, including optimization of DC dosing, vaccination frequency, route of injection, and validation of biomarkers for assessment of efficacy. The rationale for this strategy is to minimize the area of nerve injury through early prevention of expansion of inflammatory AQP4-restricted T lymphocytes. Tolerogenic DCs induce antigen-specific T-cell tolerance in vivo and have been proven to have therapeutic effects in animal models of autoimmunity; the current task is to bring tolerogenic DC therapy to clinical trial. Indeed, DC-based therapies have now entered clinical phase 1B trials focusing on MS and NMO-NMOSD. The presence of neutrophils is a characteristic feature of NMO lesions in humans. Sivelestat, an inhibitor of neutrophil elastase, has been beneficial in animal models of NMOSD, with evidence of reduction in the size of NMO lesions A central role for neutrophils in the pathogenesis of early NMO lesions has been implied in animal models of NMO, suggesting the potential utility of neutrophil protease inhibitors in NMO therapy,. Eosinophil-stabilizing actions reduce lesion severity in hypoeosinophilic mice, via anti-IL-5 antibody or gene deletion, and imply the involvement of eosinophils in NMO pathogenesis. This suggests the therapeutic utility of approved eosinophil-stabilizing drugs. Enzymatic AQP4-IgG deglycosylation or cleavage has been shown to reduce complement-dependent cytotoxicity and antibody-dependent cell-mediated cytotoxicity to ameliorate astrocyte damage and further inflammation. IgG-degrading enzyme of Streptococcus pyogenes efficiently cleaved NMO-IgG in mice in vivo and greatly reduced NMO lesions in mice given NMO-IgG and human complement. The bacteria-derived endoglycosidase S treated, nonpathogenic NMO-IgG competitively displaced the pathogenic NMO-IgG bound to AQP4, and also prevented NMO pathology, in both in vitro and in vivo studies. Aquaporumab is a synthetic nonpathogenic IgG that competes with NMO-IgG for AQP 4 binding and has already been proven in preclinical study. Optimal management of NMO includes effective treatment of acute attacks with corticosteroids and/or TPE as soon as possible; reduction of relapses using immunomodulating therapies, prevention of adverse effects, and comorbidities are important issues. Growing evidence supports the use of various immunosuppressive treatments in the chronic stages of NMO to ameliorate long-term disability. Future directions for research are emerging to direct the development of highly specific treatment strategies and vaccine strategies. Research support grants from the Far Eastern Memorial Hospital (FEMH-2017-C-009) and the Buddhist Tzu Chi Medical Foundation (TCMMP104-05-01) are gratefully acknowledged. Jarius S, Wildemann B. The case of the Marquis de Causan (1804): An early account of visual loss associated with spinal cord inflammation. J Neurol 2012;259:1354-7. Lennon VA, Wingerchuk DM, Kryzer TJ, Pittock SJ, Lucchinetti CF, Fujihara K, et al. A serum autoantibody marker of neuromyelitis optica: Distinction from multiple sclerosis. Lancet 2004;364:2106-12. Papais-Alvarenga RM, Carellos SC, Alvarenga MP, Holander C, Bichara RP, Thuler LC, et al. Clinical course of optic neuritis in patients with relapsing neuromyelitis optica. Arch Ophthalmol 2008;126:12-6. Gelfand JM, Cree BA, Nolan R, Arnow S, Green AJ. Microcystic inner nuclear layer abnormalities and neuromyelitis optica. JAMA Neurol 2013;70:629-33. Sotirchos ES, Saidha S, Byraiah G, Mealy MA, Ibrahim MA, Sepah YJ, et al. In vivo identification of morphologic retinal abnormalities in neuromyelitis optica. Neurology 2013;80:1406-14. Levin MH, Bennett JL, Verkman AS. Optic neuritis in neuromyelitis optica. Prog Retin Eye Res 2013;36:159-71. Vodopivec I, Matiello M, Prasad S. Treatment of neuromyelitis optica. Curr Opin Ophthalmol 2015;26:476-83. Wingerchuk DM. Neuromyelitis optica: Potential roles for intravenous immunoglobulin. J Clin Immunol 2013;33 Suppl 1:S33-7. Tradtrantip L, Asavapanumas N, Verkman AS. Therapeutic cleavage of anti-aquaporin-4 autoantibody in neuromyelitis optica by an IgG-selective proteinase. Mol Pharmacol 2013;83:1268-75. Kimbrough DJ, Fujihara K, Jacob A, Lana-Peixoto MA, Leite MI, Levy M, et al. Treatment of neuromyelitis optica: Review and recommendations. Mult Scler Relat Disord 2012;1:180-7. Kleiter I, Gold R. Present and future therapies in neuromyelitis optica spectrum disorders. Neurotherapeutics 2016;13:70-83. Beck RW, Cleary PA, Anderson MM Jr., Keltner JL, Shults WT, Kaufman DI, et al. A randomized, controlled trial of corticosteroids in the treatment of acute optic neuritis. The Optic Neuritis Study Group. N Engl J Med 1992;326:581-8. Bennett JL, de Seze J, Lana-Peixoto M, Palace J, Waldman A, Schippling S, et al. Neuromyelitis optica and multiple sclerosis: Seeing differences through optical coherence tomography. Mult Scler 2015;21:678-88. Nakamura M, Nakazawa T, Doi H, Hariya T, Omodaka K, Misu T, et al. Early high-dose intravenous methylprednisolone is effective in preserving retinal nerve fiber layer thickness in patients with neuromyelitis optica. Graefes Arch Clin Exp Ophthalmol 2010;248:1777-85. Yamasaki R, Matsushita T, Fukazawa T, Yokoyama K, Fujihara K, Ogino M, et al. Efficacy of intravenous methylprednisolone pulse therapy in patients with multiple sclerosis and neuromyelitis optica. Mult Scler 2016;22:1337-48. Weinshenker BG, O'Brien PC, Petterson TM, Noseworthy JH, Lucchinetti CF, Dodick DW, et al. A randomized trial of plasma exchange in acute central nervous system inflammatory demyelinating disease. Ann Neurol 1999;46:878-86. Bonnan M, Valentino R, Olindo S, Mehdaoui H, Smadja D, Cabre P, et al. Plasma exchange in severe spinal attacks associated with neuromyelitis optica spectrum disorder. Mult Scler 2009;15:487-92. Merle H, Olindo S, Jeannin S, Valentino R, Mehdaoui H, Cabot F, et al. Treatment of optic neuritis by plasma exchange (add-on) in neuromyelitis optica. Arch Ophthalmol 2012;130:858-62. Bonnan M, Valentino R, Debeugny S, Merle H, Fergé JL, Mehdaoui H, et al. Short delay to initiate plasma exchange is the strongest predictor of outcome in severe attacks of NMO spectrum disorders. J Neurol Neurosurg Psychiatry 2018;89:346-51. Trebst C, Jarius S, Berthele A, Paul F, Schippling S, Wildemann B, et al. Update on the diagnosis and treatment of neuromyelitis optica: Recommendations of the Neuromyelitis Optica Study Group (NEMOS). J Neurol 2014;261:1-6. Khatri BO, Kramer J, Dukic M, Palencia M, Verre W. Maintenance plasma exchange therapy for steroid-refractory neuromyelitis optica. J Clin Apher 2012;27:183-92. Watanabe S, Misu T, Miyazawa I, Nakashima I, Shiga Y, Fujihara K, et al. Low-dose corticosteroids reduce relapses in neuromyelitis optica: A retrospective analysis. Mult Scler 2007;13:968-74. Kageyama T, Komori M, Miyamoto K, Ozaki A, Suenaga T, Takahashi R, et al. Combination of cyclosporine A with corticosteroids is effective for the treatment of neuromyelitis optica. J Neurol 2013;260:627-34. Carroll WM, Fujihara K. Neuromyelitis optica. Curr Treat Options Neurol 2010;12:244-55. Mandler RN, Ahmed W, Dencoff JE. Devic's neuromyelitis optica: A prospective study of seven patients treated with prednisone and azathioprine. Neurology 1998;51:1219-20. Costanzi C, Matiello M, Lucchinetti CF, Weinshenker BG, Pittock SJ, Mandrekar J, et al. Azathioprine: Tolerability, efficacy, and predictors of benefit in neuromyelitis optica. Neurology 2011;77:659-66. Cree BA, Lamb S, Morgan K, Chen A, Waubant E, Genain C, et al. An open label study of the effects of rituximab in neuromyelitis optica. Neurology 2005;64:1270-2. Mealy MA, Wingerchuk DM, Palace J, Greenberg BM, Levy M. Comparison of relapse and treatment failure rates among patients with neuromyelitis optica: Multicenter study of treatment efficacy. JAMA Neurol 2014;71:324-30. Torres J, Pruitt A, Balcer L, Galetta S, Markowitz C, Dahodwala N, et al. Analysis of the treatment of neuromyelitis optica. J Neurol Sci 2015;351:31-5. Collongues N, de Seze J. An update on the evidence for the efficacy and safety of rituximab in the management of neuromyelitis optica. Ther Adv Neurol Disord 2016;9:180-8. Damato V, Evoli A, Iorio R. Efficacy and safety of rituximab therapy in neuromyelitis optica spectrum disorders: A systematic review and meta-analysis. JAMA Neurol 2016;73:1342-8. Goldsmith D, Carrey EA, Edbury S, Smolenski RT, Jagodzinski P, Simmonds HA, et al. Mycophenolate mofetil, an inhibitor of inosine monophosphate dehydrogenase, causes a paradoxical elevation of GTP in erythrocytes of renal transplant patients. Clin Sci (Lond) 2004;107:63-8. Vodopivec I, Miloslavsky EM, Kotton CN, Cho TA. A neurologist's guide to safe use of immunomodulatory therapies. Semin Neurol 2014;34:467-78. Ayzenberg I, Kleiter I, Schröder A, Hellwig K, Chan A, Yamamura T, et al. Interleukin 6 receptor blockade in patients with neuromyelitis optica nonresponsive to anti-CD20 therapy. JAMA Neurol 2013;70:394-7. Araki M, Matsuoka T, Miyamoto K, Kusunoki S, Okamoto T, Murata M, et al. Efficacy of the anti-IL-6 receptor antibody tocilizumab in neuromyelitis optica: A pilot study. Neurology 2014;82:1302-6. Ocilizumab vs. Azathioprine in Neuromyelitis Optica Spectrum Disorders (TANGO). Available from: https://www.clinicaltrials.gov/ct2/show/NCT03350633. [Last accessed on 2017 Nov 22]. Hillmen P, Young NS, Schubert J, Brodsky RA, Socié G, Muus P, et al. The complement inhibitor eculizumab in paroxysmal nocturnal hemoglobinuria. N Engl J Med 2006;355:1233-43. Pittock SJ, Lennon VA, McKeon A, Mandrekar J, Weinshenker BG, Lucchinetti CF, et al. Eculizumab in AQP4-igG-positive relapsing neuromyelitis optica spectrum disorders: An open-label pilot study. Lancet Neurol 2013;12:554-62. A Double Blind Trial to Evaluate the Safety and Efficacy of Eculizumab in Relapsing NMO Patients (Prevent Study). Available from: https://www.clinicaltrials.gov/ct2/show/NCT01892345. [Last accessed on 2018 Jul 2]. Varga L, Farkas H. RhC1INH: A new drug for the treatment of attacks in hereditary angioedema caused by C1-inhibitor deficiency. Expert Rev Clin Immunol 2011;7:143-53. Lucchinetti CF, Mandler RN, McGavern D, Bruck W, Gleich G, Ransohoff RM, et al. A role for humoral mechanisms in the pathogenesis of devic's neuromyelitis optica. Brain 2002;125:1450-61. Levy M, Mealy MA. Purified human C1-esterase inhibitor is safe in acute relapses of neuromyelitis optica. Neurol Neuroimmunol Neuroinflamm 2014;1:e5. Di Caro V, Phillips B, Engman C, Harnaha J, Trucco M, Giannoukakis N, et al. Retinoic acid-producing, ex-vivo-generated human tolerogenic dendritic cells induce the proliferation of immunosuppressive B lymphocytes. Clin Exp Immunol 2013;174:302-17. Tarbell KV, Yamazaki S, Steinman RM. The interactions of dendritic cells with antigen-specific, regulatory T cells that suppress autoimmunity. Semin Immunol 2006;18:93-102. Yamazaki S, Patel M, Harper A, Bonito A, Fukuyama H, Pack M, et al. Effective expansion of alloantigen-specific foxp3+ CD25+ CD4+ regulatory T cells by dendritic cells during the mixed leukocyte reaction. Proc Natl Acad Sci U S A 2006;103:2758-63. Di Caro V, Phillips B, Engman C, Harnaha J, Trucco M, Giannoukakis N, et al. Involvement of suppressive B-lymphocytes in the mechanism of tolerogenic dendritic cell reversal of type 1 diabetes in NOD mice. PLoS One 2014;9:e83575. Treatment of Multiple Sclerosis and Neuromyelitis Optica with Regulatory Dendritic Cell: Clinical Trial Phase 1 B. Available from: https://www.clinicaltrials.gov/ct2/show/NCT0228367. [Last accessed on 2017 Nov 7]. Giannoukakis N, Phillips B, Finegold D, Harnaha J, Trucco M. Phase I (safety) study of autologous tolerogenic dendritic cells in type 1 diabetic patients. Diabetes Care 2011;34:2026-32. Hilkens CM, Isaacs JD, Thomson AW. Development of dendritic cell-based immunotherapy for autoimmunity. Int Rev Immunol 2010;29:156-83. Saadoun S, Waters P, MacDonald C, Bell BA, Vincent A, Verkman AS, et al. Neutrophil protease inhibition reduces neuromyelitis optica-immunoglobulin G-induced damage in mouse brain. Ann Neurol 2012;71:323-33. Papadopoulos MC, Verkman AS. Aquaporin 4 and neuromyelitis optica. Lancet Neurol 2012;11:535-44. Zhang H, Verkman AS. Eosinophil pathogenicity mechanisms and therapeutics in neuromyelitis optica. J Clin Invest 2013;123:2306-16. Ratelade J, Smith AJ, Verkman AS. Human immunoglobulin G reduces the pathogenicity of aquaporin-4 autoantibodies in neuromyelitis optica. Exp Neurol 2014;255:145-53. Tradtrantip L, Ratelade J, Zhang H, Verkman AS. Enzymatic deglycosylation converts pathogenic neuromyelitis optica anti-aquaporin-4 immunoglobulin G into therapeutic antibody. Ann Neurol 2013;73:77-85. Tradtrantip L, Zhang H, Saadoun S, Phuan PW, Lam C, Papadopoulos MC, et al. Anti-aquaporin-4 monoclonal antibody blocker therapy for neuromyelitis optica. Ann Neurol 2012;71:314-22.